When I was a kid, my mom made us take our shoes off before entering the house. Many of my friend’s Moms did the same thing. The reason was simple, they wanted to keep the carpets in their home a focal point for the house. But we do not treat carpets in our car the same as in our home. It may be because it is not practical to take your shoes off when getting into the car. Plus, it is nearly impossible to avoid transporting things like pets, kids, grocery bags, supplies from the home center, etc…, which means exposing auto carpets to potential stains and odors. So, when your car’s carpets are soiled, stained, or even smelly, what can you do? Well you clean of course. And that leads us to the pertinent question. 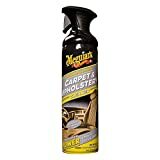 What cleaners are best for cleaning my car’s carpet? Well, that is a good question that deserves our attention. So, let’s get to it! The initial matter to you need to know is how you plan to clean. By this, I mean, do you want to use a hot water extractor or are you using a carpet brush and cloths? You want foam or lather if you are manually cleaning to help lift and remove the dirt. You want no or low-foam if using an extractor to prevent clogging and damage to your machine’s pump. Ready-to-use products require no mixing and are simple to use. Some people like the ease of use and are willing to pay a little more to get it. But some like the control a concentrate offers. You can make strong to weak dilutions, depending on the job you are tackling. And you pay less for these products because you do not ship excess water and one bottle of concentrate makes a lot of cleaner. If you are using an extractor, then you need to consider if you want to pre-treat the carpet or add a cleaner into the extractor. Most products intended to be added into the extractor are concentrates. As with all cleaners, carpet cleaners have limitations and it is worth a quick bullet list to help manage our expectations. You must do a test spot in an out-of-sight location when using a cleaner for the first time to ensure the product will not damage your carpet or fabric. You may need to do multiple applications with the carpet cleaner to get heavily soiled areas clean. You still need to keep a spot remove kit around for the difficult jobs and special stains. There is no carpet cleaner on the market that will remove every type of spot and stain. Read some Amazon reviews for carpet cleaners. There is always a certain percent of one-star reviews and they are all almost identical: The cleaner did not remove my stain. Well, that is why you need to keep a spotting kit in your tool box. Some stains need special treatment beyond your carpet cleaner. And one more quick point for emphasis. A cleaner, any cleaner, has the potential to harm some carpets and fabric. You need to keep this in mind, and if using a new product, do a test spot in an obscure location to make sure it is safe on your carpet or fabric. Folex Instant Carpet Spot Remover is ready-to-use, supplied in a trigger spray bottle, and has been on the market for decades. It is a water-based formula with no volatile organic compounds (“VOC’s”) or chlorofluorocarbons (“CFC’s”) and is safe for skin contact. They post their material safety data sheet (“MSDS,” sorry for all the acronyms, but it is how people talk about these things) online to provide the information about the fire and health hazards, which are low to none. So, for those worried about the environment, and the user’s health, this product is worth considering. The product is designed to be sprayed on and blotted dry, no rinsing needed. They even recommend against scrubbing with a brush to avoid damage to the carpet fibers. The product reviews are numerous, with the vast majority being positive. So, simple to use and effective in most cases, two signs of a good product. But one caution, if you are using this product for the first time on a carpet, do a test spot in an out-of-the-way place. There is a slight potential for color change and/or color leeching on some carpets with this product. The spot removing power is good, but as is the case with most general-purpose spot removers, there were some stains the Folex Spot Remover failed to oust. Also, the odor elimination is not as good as some of the other products on our list. For use around the house, Folex Spot Remover multi-tasks and works well on carpets and clothing. It is a nice bonus whenever a product does more than one thing. 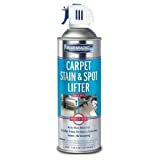 Blue Magic 900 Carpet Stain & Spot Lifter is supplied in an aerosol can, which is nice when spraying larger areas. No tiring your hand by repeatedly pulling the trigger on a spray bottle. Plus, the foam from the aerosol can is easily visible, letting you know where you have sprayed. Some prefer the ease and foaminess of an aerosol carpet cleaner. The use of the product is simple, and we all like easy. Spray it on, blot dry, and repeat as necessary. Note the repeat step, some found it consumed a lot of product and tiresome. The overall effectiveness at removing stains is good, but like all spot removers, it is easy to find stories of users who had spots that did not come out with this product. You still need to keep a spot kit around for those tougher jobs. Also, there are some risk of discoloration of plastic, so protect the surrounding areas. As for versatility, Blue Magic Carpet Stain & Spot Lifter can be used in the home as well as the automobile. It’s not exactly the Swiss knife of the cleaning world, but not a uni-tasker either when you think of all the “other” places you might need to clean carpet, like a boat or RV. Having a good stain and spot remover around that can be used on any carpet is handy. For those who like guarantees, this product prints theirs right on the front and back of the can. If you are unhappy, they will replace the product or refund your money. With this product you do need to take some precautions. It needs to be used in a well-ventilated area to avoid breathing the vapors. Also, it contains flammable VOC’s and you should never subject it to heat, even when stored. Use protective gear as necessary since this formulation is an irritant to eyes, skin, and the respiratory system. Parents may want to be careful around kids and pets, too. Fortunately, Blue Magic does have their MSDS online for easy access to the product information regarding safety. Chemical Guys Fabric Clean Carpet & Upholstery Shampoo & Odor Eliminator has received several positive reviews. I know, looking at customer reviews is slippery business and you have to read between the lines. In this case, most of the reviews are constructive and include pictures to document the results. No, the pictures were not for complaining, they were because the cleaner impressed with how it worked. Chemical Guys supplies this product as a concentrate, so you must mix the shampoo before use. Yes, you have an added step of blending with water, but a bottle will make a lot of shampoo. Plus, you eliminate paying to ship heavy water and you have more control. 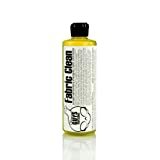 You can mix a strong solution for cleaning tough stains, and a dilute solution for gentler all-purpose cleaning. An interesting ingredient in this carpet shampoo is the enzyme odor eliminator. A product that might get rid of odors is a great idea, but does it work? Fortunately, this product does remove several problem odors using an enzyme ingredient to breakdown the offending substances. It will not work on all odors, but it does have a good track record of removing foul smells from carpet. With the Chemical Guys Fabric Clean there is a mild citrus odor after cleaning, but it is pleasant and dissipates within a few days, if not sooner. Finally, the toxicity profile for the product is low compared to some of the other carpet cleaners on the market. Fabric Clean is not just for your car’s carpet. 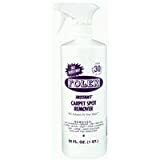 You can use this product on upholstery and fabric (i.e. clothing). Versatile, hardworking products always get a kudos from me. Cleans & Deodorizes in one step. Low foam with odor eliminator. Designed to work with carpet extractors. 3D Upholstery and Carpet Shampoo is supplied as a concentrate. To use, add one to two ounces of shampoo to a gallon of water. You have control over the strength depending on the cleaning job and your bottle makes a lot of cleaner. As a bonus, you don’t shell out money to ship excess water. But unlike other products on our list, this is a high foaming product that is best used with a carpet brush or dual action polisher. You will definitely want to keep this product away from your hot water extractors. 3D Upholstery and Carpet Shampoo incorporates a fabric brightener, allowing the cleaner to bring out the original colors in your fabric. A nice bonus. As a second bonus, this product includes an odor eliminator, very useful when tackling some of those smelly carpet cleaning jobs. As we all know, carpets can hold an odor and a cleaner that also deodorizes is a welcomed friend. 3D does mention that you should treat tough stains with a separate spot remover before cleaning with their shampoo. And they have good intentions and reasons for this recommendation. 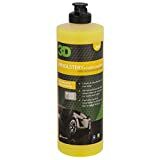 Cleaning with the 3D product after treating tough stains with a separate spot remover helps rinse out the spot eliminator, which is probably an aggressive chemical. Also, you reduce the possibility that a ring from the treated spot reappears over time. Most users report a pleasant, citrus odor. And that makes sense since 3D states this product is lemon scented. This product is also hypoallergenic and safe for skin contact. Stated simply, this product is easy on the user’s health. For ease of use, a premixed product in a trigger spray bottle is hard to beat. Mothers Carpet and Upholstery Cleaner is such a product. It is a versatile product, recommended for use on all fabrics and carpets, including the headliner of your car (but be careful to lightly brush and avoid aggressive scrubbing or vacuuming of your headliner). It is also a water-based product and claims to be environmentally safe. So, compared to some harsher products, this is a more earth and user-friendly product. There were a few complaints about this product failing to extract stains, but as I stated at the start of this guide no general-purpose spotter will remove every stain and you still need to keep a good spotting kit around for tough or unusual stains. While Mothers Carpet and Upholstery Cleaner did remove some odors, it does not contain an odor eliminator and will not remove odors consistently. For those who like warranties, Mothers offers a satisfaction guarantee. Coming from a well-known wax and polish manufacturer, the brand name does have a loyal following. 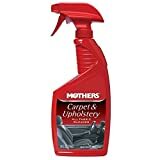 So, if you are a Mothers fan, you have a fabric and carpet cleaner to add your arsenal. Like many of the cleaners on our list, take care to avoid eye contact and keep out of reach of children. Another formula in a pressurized, aerosol can, Meguiar’s Carpet and Upholstery Cleaner adds a new wrinkle. They have a dual spray tip. You can spray a mist over an area of carpet, or a concentrated foam on a focused spot. This product is designed to lift the dirt with the foaming action and dries quickly, leaving no residue. For the most part, it works as advertised. Some users have even posted impressive before and after photos on line. However, there are times when you will need to apply multiple times to achieve the level of cleanliness you want, meaning you use a lot of product. The odor was strong for some while cleaning (one user claimed it was like Fabreeze). But after use, it does leave a clean, pleasant odor. As with almost all general cleaners, there are times when this will not remove that mystery spot. Keep that spotting kit around. And this product has removed some foul odors, but it does not contain an odor eliminator and will not remove most foul smells. In shipping, there were instances of damage to the sprayer. So, if you buy online, use a reputable vendor who knows how to package properly. Also, all pressurized cans can leak, which this product did do to some customers. Keep that in mind when you store the product; it may leak a little. Also, pressurized cans should be stored away from heat and flame. Do not spray near ignition sources, like open flames, cigarettes, high heat, etc. 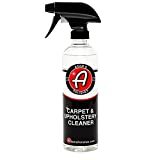 A product designed to clean without foaming action, Adams Carpet and Upholstery Cleaner uses no soap, dyes, or perfumes in the formula. It is a clear liquid, which further emphasizes the less is more philosophy of this Adam’s product. The approach works, and most users are happy with the results. Adam’s Carpet and Upholstery Cleaner is non-toxic and hypoallergenic. It is skin safe and an environmentally friendly product. The cleaner is used as is, no mixing required. Of course, that means you cannot vary the strength of the cleaner like you can with competing concentrates. But you can apply this product “heavy” to tough stains, and multiple times if necessary. 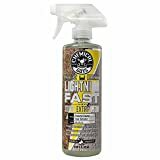 Chemical Guys Lightning Fast Carpet and Upholstery Stain Extractor is a versatile product you can use on most fabrics (even sneakers! ), as well as carpet and upholstery in your car. It is supplied as a concentrate and you can dilute this cleaner up to 20:1 with water. So, a gallon will last a long while. Products that work in multiple ways are always welcome, and this one can be used to pretreat stains or as the cleaning additive in an extractor. Plus, it works on rubber. On the Chemical Guys website, there are multiple pictures of this product in action, cleaning old fashioned white walls. And if you have a foul smell haunting your auto cabin, this product contains enzymes to break down and eliminate odors. As much as you do not want to admit it, your precious car is exposed to things like pets, dirty shoes, leaky groceries, and fast food. And what is that smelly stain by the child seat? You get it, an odor eliminator is useful. Maybe it’s me, but concentrates sold in spray bottles are confusing. Spray bottles tend to imply a product is ready to use. But keep in mind you still need to dilute this product for some jobs even if you bought the spray bottle size and not the gallon jug. As with most cleaners, you may need to reapply Lightning Fast to remove tough stains or even resort to a spotting kit. No cleaner works on every possible stain. Have I drilled that one in yet? 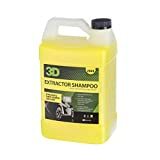 Some manufacturer’s make finding information difficult, but 3D Extractor Shampoo is well presented and even the safety data sheet (“SDS”) is available on line. There are also videos, for those who love Youtube. Right up front, 3D states that this product is designed for extractors, and it is a low-foam product intended to be easy on the pump inside your expensive equipment. But even still, on the Amazon listing page they recommend use of a defoamer in an extractor. 3D appears to appreciate that you want your pricey extractor to live a long life. The formula contains fabric brighteners to help your carpet and upholstery shine. It also contains an odor eliminator, and as previously stated for other products, getting rid of offensive smells is a nice bonus when cleaning your carpet and upholstery. For those who like green products, this one states it is green right on the front label. It is biodegradable and VOC compliant. So, it is gentle on the environment. But take care to avoid eye and prolonged skin contact. It is an alkaline product and can be an irritant. This product is Jasmine scented, and users liked the smell of the product. It leaves a clean, pleasant odor. 3D also states that you may need to use a degreaser, or some other spot remover, prior to cleaning your carpet and upholstery. It is refreshing to see a manufacturer clearly state the need to treat some spots differently ahead of general cleaning. So, are you ready to clean some carpet? I hope so. You have choices whether you are using a scrub brush and cloths or an expensive extractor. Those who want to spray a thick foam over larger areas, the pressurized, aerosol cans from Blue Magic and Meguiar’s have you covered. They are widely available as well as easy and fast to use. But keep in mind they need to be used and stored away from heat and open flame. For those who like green products, you will want to avoid the pressurized, aerosol cans. But you can consider products from Folex, Mothers, Adam’s and 3D. These manufacturers tend to make products that are in tune with Mother Nature. Need to remove an offensive odor? Our list has that base covered as well. Consider the 3D or Chemical Guys products that contain enzymes to break down foul smells. You gotta love multi-tasking products, especially ones that help with problems like getting rid of wet dog or cigarette odors. Finally, for those who want simple no mixing, easy to use, versatile carpet cleaners for use in the automobile, home, RV, laundry, etc. take another look at the Mothers and Folex products. The choice is yours, so pick your favorite and make those carpets a focal point. Your precious car or truck deserves it.